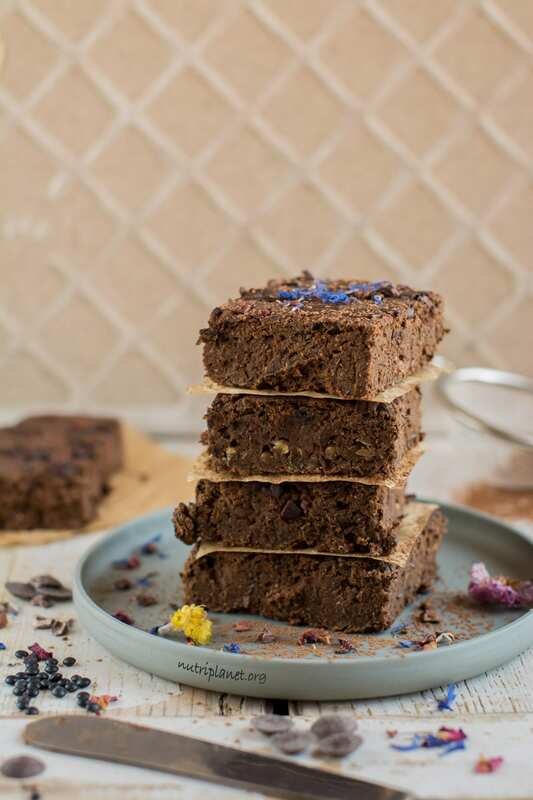 Those grain free vegan paleo brownies are perfect, if you’re looking for a moist and gooey kid-approved recipe that is ready in under an hour. I have a story that goes with those brownies. One afternoon my 8-year-old had his classmate over and obviously I had to feed them with something. So, I decided I’d make those paleo brownies. When they were out of the oven and cooled a bit I asked the boys to come and eat. The friend was suspicious at first (I didn’t disclose the ingredients), but then decided to try a small piece. Having finished this piece, he asked for a second one saying that it was pretty yummy. Having finished the second piece, he asked for a third 🙂 After they had played for a while, he came back asking for more… and then again 🙂 Needless to say, the brownies were finished by the time he went home. My first try with grain-free brownie recipe was absolutely delicious, but the pieces fell apart quite easily. It was because I left rolled oats out of my base recipe (Lentil Brownies), but didn’t think about bringing in another binding agent. 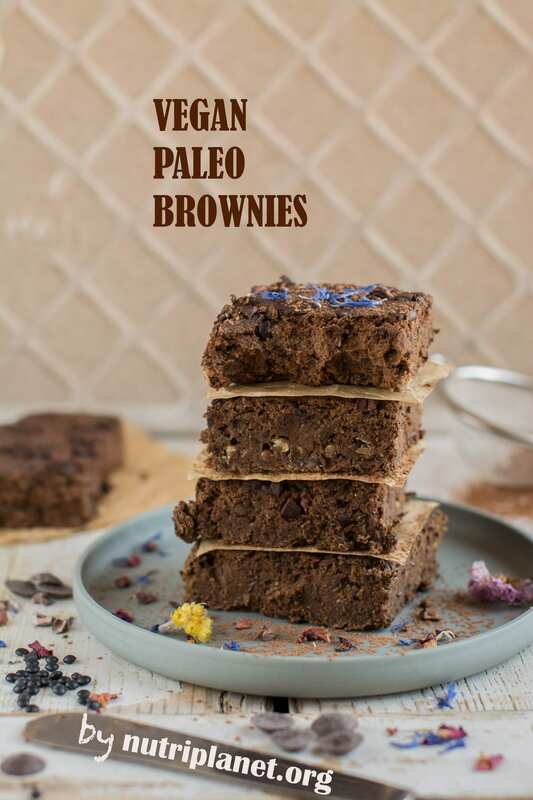 In this version of my vegan paleo brownies, the binder is psyllium husk powder that really does its job so well. In fact, you can lift up the whole brownie without breaking it apart. Next, I used sprouted and boiled lentils as the main mass for those paleo brownies. 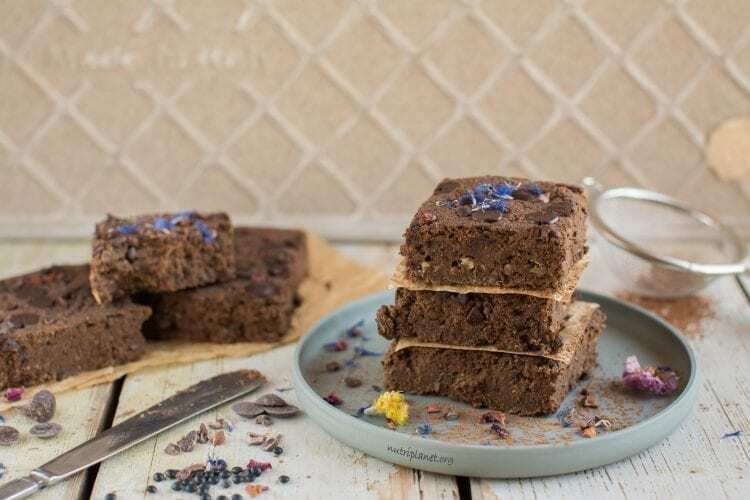 By all means, you don’t need to go as far as sprouting, but it does make the brownies even more blood sugar friendly by reducing the glycemic load of lentils. Honestly, there’s no effort involved in sprouting the lentils. Furthermore, you won’t even need any special jars or other customised equipment. Instead, a bowl, sieve and clean kitchen cloth work wonders. First, soak lentils for about 8 hours. Add about 1 tbsp. of apple cider vinegar or lemon juice to your soaking water. This will aid in the development of phytase, the enzyme needed to break down the phytic acid found in grains, nuts, beans, and seeds. Then, place them in a sieve and rinse well. Now, place the sieve over a bigger bowl and cover with clean kitchen cloth. You’ll already see tiny sprouts in the morning (if you put them to sprout the evening before). You can always let the sprouts grow a bit taller if you have time. However, keep them about 3mm or less. As you can see sprouting is more about planning rather than hard and complicated work. Let me know if you make those brownies or if you have any questions! Just comment below! Start with soaking Beluga lentils for 8 hours. Then rinse, drain and boil the lentils. 2 cups of boiled lentils is about 115g (4.06oz) dry lentils. Or buy enough of canned lentils. Make sure to rinse and drain those as well. Next, add all the ingredients (except chocolate chips and cocoa nibs) into food processor and process until you have homogeneous and smooth batter. You’ll need to scrape the sides every now and then. Then, transfer the batter onto baking sheet lined with parchment paper and spread it out into about 17x17cm (6.8 inch) square. Finally, sprinkle on some chocolate chips and cocoa nibs, press them down and bake the brownies at 175°C (350°F) for 35 minutes. Let cool before slicing. Nutritional info (⅛ of the recipe): 106 kcal, 15.9g carbohydrates (59.8% of kcal), 3.75g fats (31.8% of kcal), 5.1g protein (19.2% of kcal), 5.28g fibre, and 3.15 GL points. P.S. Watch step-by-step video tutorial under my highlighted stories on Instagram! For more decadent snack, have the brownies with Vegan Caramel Sauce or Chocolate Sauce. Take it one step further and sprout the lentils before cooking. Nothing fancy or complicated – just leave soaked and rinsed lentils into sieve over a bigger bowl and cover with clean kitchen cloth. You’ll see small sprouts in the morning and can boil them, as you’d do with soaked lentils. This extra effort reduces the glycemic load of lentils even further. The same weight (260 grams, 9.2 ounces) of sprouted and cooked lentils is about 2 cups. Use any plant milk instead of oat milk. Just remember that if you choose an unsweetened, but naturally NOT sweet milk, you might need to add a bit more of sweetener. 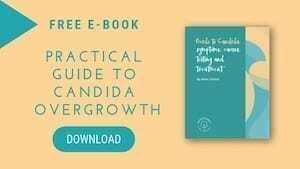 Add any sweetener you like, if you’re not on Candida diet. Mesquite flour can be substituted with lucuma, yakon or even by adding more carob. Use any nut protein powder/flour instead of coconut flour. I suggest going for protein powder that had reduced fat content. Simply put, ground nuts and seeds are very high in fat and absorb less liquid. 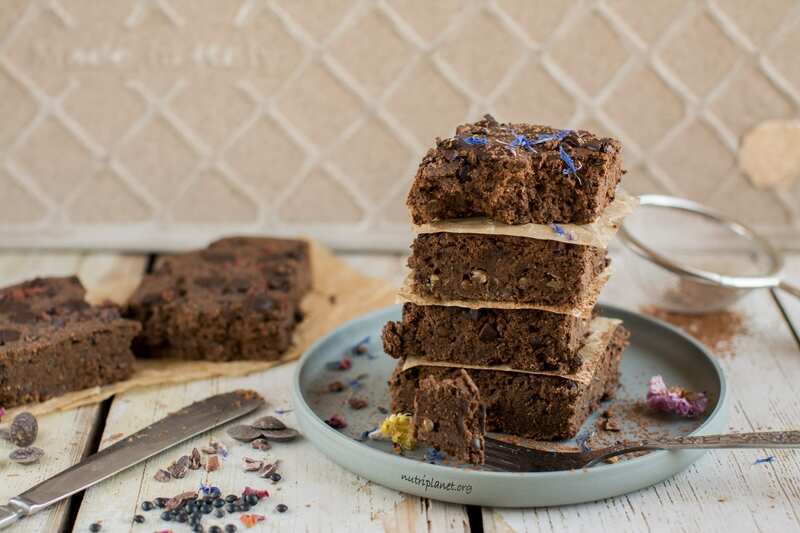 Watch the video of my Lentil Brownies as the process is very similar. I’m so glad to hear that Christine! This is what I’m trying to show here — healthy IS delicious 🙂 And well done on sprouting those lentils!